So here’s a cool little short film I’ve found that you can watch right now! It’s been on Vimeo for a year, and most of it was televised on [adult swim]’s series Off the Air. However, if you haven’t seen it yet, I recommend you check out Land by Masanobu Hiraoka. I love this kind of stuff. The idea of liquid forms taking shape to become minimalist imagery is both novel in concept and brilliantly executed. It’s a fascinating piece of animation, made even more beutiful being paired up with Aimar Molero’s soothing soundtrack. If you’re as mesmerized as I am, take a look at Hiraoka’s other works. A lot of it is in the same style, and it all makes for an enjoyable watch. So I stumbled upon this one by complete accident. Digging through it’s history, I found out that it got most of it’s funding through an indiegogo campaign, and didn’t seem to receive very much attention from the video game press upon it’s release, back in January. 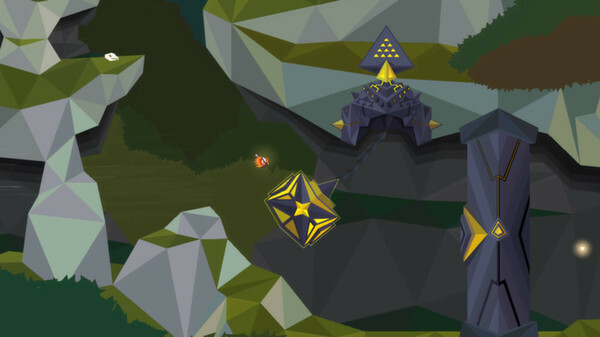 So let’s dive in and check out Secrets of Raetikon. Story’s pretty simple on this one. You’re a bird flying through a forest that houses what appear to be ruins of an ancient civilization. You come across a huge mechanism of some sort, and then set out to find and collect the artifacts necessary to power it. Gameplay-wise, it’s a side-scrolling open exploration game. 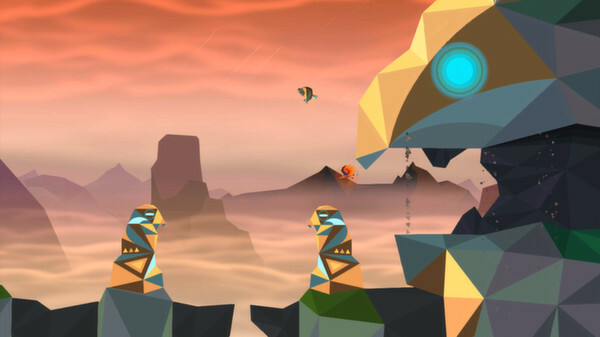 Kinda like Metroid… but with more nature! Apart from collecting the main artifacts, you’ll face off against hostile predatorial animals, solve environmental puzzles, collect glowing blue things called rhinestones (I’m still not sure what they do) and collect letters of an ancient language that allow you to decipher mysterious messages hidden all over the place. The game has a really cool look, using minimalistic artwork to assemble an endless amount of triangles into an beautiful forest. The controls are simple, but fun to play around with. And there’s an air of mystery that’s constantly tempting you to see all the world has to offer. On the down side, It’s short, and I mean really short. You’ll beat it in two, maybe three hours. And without giving anything away plot-wise, the ending, in what I assume is an attempt to be funny, is brief, makes no sense, and is far from satisfying. I still like it, though. At the end of the day, it’s ten dollars for a small but unique world and a fun bird mechanic. If that sounds like a good deal to you, then look it up on Steam and hop on-board. However, if you’re just looking for a really good exploration game, you’re better off looking elsewhere.